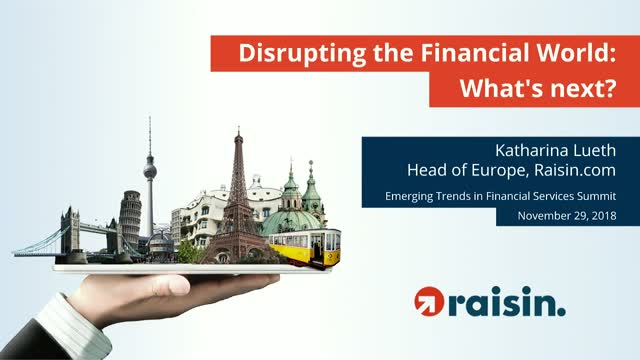 Katharina Lüth is Head of Europe at Raisin. As Head of Europe she is responsible for scaling the platform internationally and running the non-German language platforms allowing customers from across the European Union access to higher interest and better savings products with the highest convenience possible. In addition, she is responsible for Raisin’s open banking partnerships such as the integration of the Raisin products in the N26 app. Prior joining Raisin, Katharina spent 7 years with McKinsey & Company. As a senior project manager she mainly served major European universal and private banks. Main focus areas were asset management/private banking, pricing, advisory concepts, and lean transformations. Katharina worked predominantly across Europe but also in Latin America and Africa. Katharina holds an MBA from IESE Business School as well as a BSc. in International Business with a major in Finance from both Northeastern University, MA and Reutlingen University. Title: Disrupting the Financial World: What’s next?